Should you tolerate your child's temper tantrums? 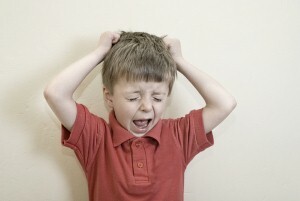 Home » Kids » Should you tolerate your child’s temper tantrums? Should you tolerate your child’s temper tantrums? As a dad, you will likely witness an interesting phenomenon in your children's behavior as they mature from infants to toddlers – where innocent crying fits once existed, more calculated temper tantrums have taken their place. According to the National Association of School Psychologists, such behavior generally peaks between ages 1 to 4 and is equally common to girls and boys. Tantrums can take many different forms like crying, screaming, stomping, yelling, kicking, hitting and breath holding. Of course, dealing with this incessant behavior day after day can wear on parents' nerves like nothing else, but what can be done to stop it? Here are some tips and tricks for best practices when it comes to child outbursts. Tantrums often occur as a result of your child's developing autonomy. They want to control the world around them, but become frustrated when doing so proves more than they can handle – resulting in high-pitched aggravation. As a parent, your best bet for dealing with tantrums may be to avoid them altogether. Place off-limits items out of reach, reward children for good behavior and consider accommodating requests that aren't too unreasonable rather than automatically saying "no." However, don't give the impression that you're giving into their demands – this will only encourage future tantrums. While it may seem easier said than done, keeping cool under pressure will help prevent your child's tantrum from spinning out of control. Little ones can sense their parents' aggravation (it may even be their objective) and use this as an excuse to act out even more. By remaining calm, you won't allow them the satisfaction of negative reinforcement. Sometimes, your best efforts just aren't enough to deal with a misbehaving child. If temper tantrums become a common occurrence several times a day, you may need to take a very specific action. Impose a timeout, take away a favorite item or ground your child to get the message across – it may be difficult, but sometimes a small disciplinary move can go a long way.